Since the eviction of Occupy protestors from encampments in many cities throughout the world, smaller and more targeted occupations have continued. Workers in a Chicago factory occupied - with the support of their union - to protest layoffs. Teachers and students in Tucson staged a walkout to protest the removal of Chicano history books from the curriculum. Home foreclosures were disrupted, even avoided, by direct community action. But what does it all mean? What do we talk about when we talk about "revolution", if we talk about it at all? Journalist Amelia Stein sat down with some of our most prominent thinkers, artists, and activists and asked them. The resulting conversations were lively, thoughtful, and engaging. 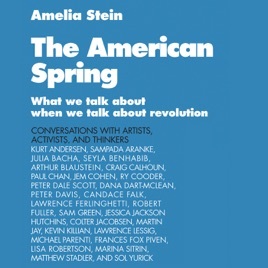 This is the perfect handbook for anyone looking to engage more deeply with our own, ongoing, American Spring.